FIND OUT IF A CAREER IN REAL ESTATE IS RIGHT FOR YOU! 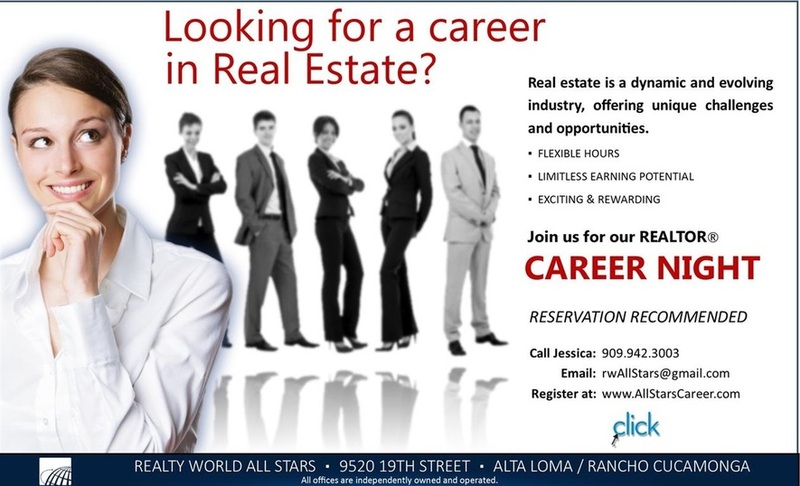 AT REALTY WORLD'S CAREER NIGHT, YOU'LL LEARN HOW TO QUALIFY FOR A REAL ESTATE LICENSE, HOW TO PASS THE STATE EXAM, WHAT IT WILL COST YOU TO GET A LICENSE AND GET STARTED IN THE BUSINESS. IN ADDITION,WE'LL TALK ABOUT WHAT A REAL ESTATE AGENT REALLY DOES ALL DAY AND GIVE YOU ENOUGH INFO TO DECIDE IF REAL ESTATE IS A GOOD CHOICE FOR YOU. COME MEET THE HALL OF FAME BROKER-OWNERS, JOE THOMAS AND KARLA ELKEBIR, AND EXPLORE THE WORLD OF OPPORTUNITY AVAILABLE TO THOSE WHO HAVE A REAL ESTATE LICENSE. KARLA AND JOE WILL SHOW YOU WAYS TO QUICKLY QUALIFY FOR AND PASS THE CALIFORNIA STATE LICENSE EXAMINATION. YOU'LL ALSO LEARN ABOUT THE BENEFITS OF BEING THE CEO OF YOUR OWN BUSINESS AS A LICENSED REAL ESTATE AGENT. AND IN A FRANK AND OPEN DISCUSSION, KARLA AND JOE WILL ANSWER YOUR QUESTIONS, SHOW YOU WAYS THEY CAN HELP YOU ACHIEVE SUCCESS, AND EVEN HELP YOU DETERMINE WHETHER OR NOT A CAREER IN REAL ESTATE IS THE RIGHT CHOICE FOR YOU. DON'T MISS OUT ON THIS FREE, NO OBLIGATION CAREER WORKSHOP. IT ONLY TAKES A FEW MOMENTS TO REGISTER.